When the Roccbox first showed up last year on Indiegogo, the campaign price was about $300 USD. It looked interesting to me, but there were a rash of interesting new pizza ovens popping up, and they weren't all that great. The Roccbox also seemed a bit expensive for the size, and I wanted to wait for some real world reviews to come in before I was willing to commit that much money on it. The Roccbox eventually shipped and the reviews came in, and it looked genuinely good. The price also jumped up to $600 USD. There was no way I was going to pay that much money for one since I already had a couple of good little homemade pizza ovens. Then over on the Pizza Making forums, I saw that someone in southern Washington (~200 miles away) was selling their lightly used Roccbox for the original campaign price of $300. I sent off some emails and as luck would have it my neighbors were currently in the area (thanks Ryan and Heather! ), and a few days later the Roccbox was at my house. Every pizza since then has come out of the Roccbox, and I couldn't be happier with it. In fact, if it broke today, I'd easily spend the $600 to get a new one ASAP. 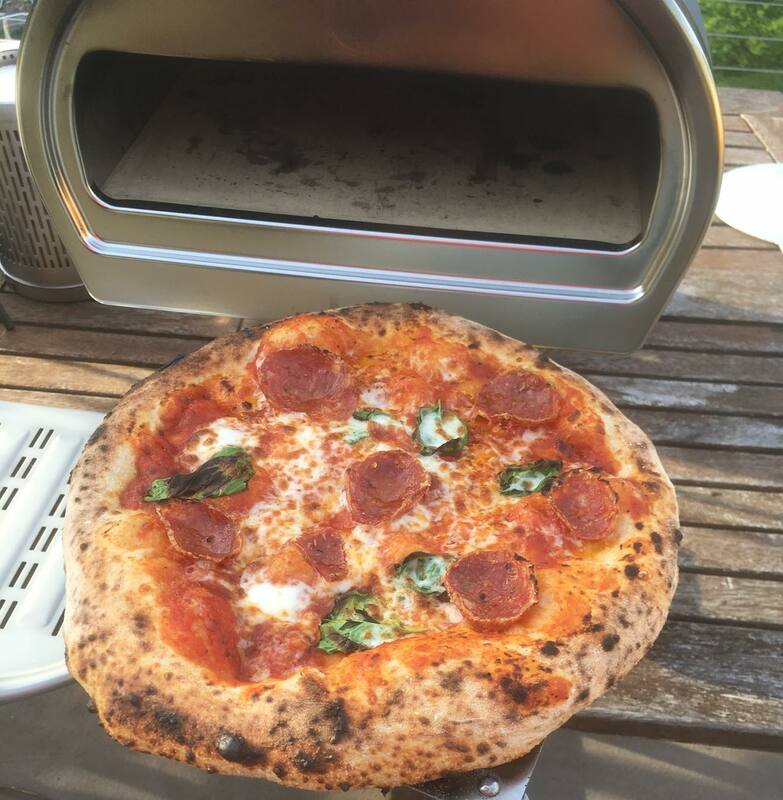 If you're into neapolitan style pizza and are looking for a nice little propane powered oven, I can't recommend anything better than a Roccbox. Super fast startup. It only takes about 20-25 minutes getting the Roccbox up to temperature. You just turn it on, and walk away. My old wood fired oven (WFO) would take between 6-8 hours of babysitting and feeding it wood to get it up to the right temperature. My latest homemade electric oven takes about 40 minutes, and I had to always keep an eye on it. The Roccbox is super portable. At about 45lbs, it feels a little heavy, but that doesn't mean it can't come out with you easily. The legs fold up and it's pretty compact. You'll still have to lug around a gas canister, but compared to a WFO it's a dream to move. The Roccbox is very forgiving. Unlike a WFO you can easily adjust the flame, adjusting the temperature to your dough needs. Has your dough not quite proofed enough? You can easily dial back the heat to compensate. And comparing it to my electric oven- well it only had an on and off switch. It was either 900° or off. You can cook other things in it. When the green beans were growing in our garden we would pick a handful, throw them in a stainless steel pan with some olive oil, salt, and sliced cherry tomatoes. 8 minutes later we had an awesome side dish to go with our dinner, and we didn't even have to warm up the Roccbox first. It also has a pretty active community doing some pretty interesting things with it. Including Adam Atkins of Peddling Pizza, who carts around a pizza stand via a custom bicycle trailer. The Roccbox might be a bit pricy for you. But when comparing it to a WFO, it's a fraction of the cost (I spent around 5k on mine). If you want neapolitan style pizza at home, it's a good value. The wood burner. It's horrible. I know some people have had success with it, but I haven't even come close. I've tried kiln dried kindling, a couple of different types of hardwood, and I've even taken a metal cutting tool to the wood burner to try and get some more airflow into it. The main problem with the wood burner in my experience is that it fills up with ash too quickly, and there's no way to get rid of that ash without detaching it from the main unit. It seems like it should work, but in practice it doesn't. It's a very common complaint from Roccbox owners. And because of that, I can only recommend that you use the gas burner it comes with. I would ship it with a turning peel in addition to launching peel it comes with. Don't get me wrong, the peel it ships with is very good. But having to take the pizza away from the flame for any amount of time, even to just turn it, is going to make for a worse bake. I got around this problem by cutting down one of my WFO turning peels, but that's an expensive operation and you can probably get away with one like this. There is a learning curve if you don't already know how to use a turning peel. But flour is cheap, and you can make lots and lots of test pizzas. So in the end, I'm super happy with my Roccbox. I'd even go far as to say it's one of my favorite things ever. Want to see more of my pizza pics from the Roccbox? Currently the top 14 pizza pics on my instagram page came out of it.